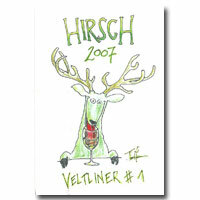 After Gary V’s less-than-raving review of this wine last week on Wine Library TV, we decided to give the Hirsch Veltliner #1 GruV a try. We went into this tasting knowing the wine retails about about $18/bottle which elevates it from the inexpensive liter category and at 11.5%abv we were certain it would not be offensive. However, our description was, “very much an every day Grüner, while packed with flavo and eminent complexities it is still very much a wine intended to be drunk young and on that’s easy drinking.” We were also told the wine is made from a combination of biodynamic estate grown and sourced fruit. So from there we took a swirl, a sniff and a sip and we came to just that conclusion: it’s an every day Gruner. Bright nose of white pepper, apple and green peas, balanced acidity and a decent finish on the palate with the same characteristic Grüner qualities. To us, it was a good value wine, definitely what we paid (or would have paid for) and good company to light food or just good conversation.